The Lutwyche Reach Bushcare Group operates along a section of Kedron Brook channelised in the late 1970’s following flooding in 1974. 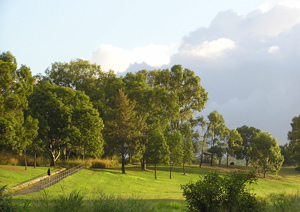 Most sites are between the Gympie Road Bridge and the Gilbert Road Bridge although group members have been involved in plantings in upstream areas near Webster Road. Despite the severe modification of the channel, it still provides an area of open space and natural environment that is important for human and other inhabitants. 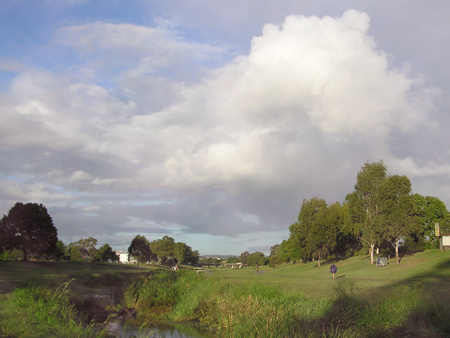 Grassy verges along Kedron Brook provide cover and habitat for several species of birds such as Cisticola and Crakes, and lizards, as well as being a refuge for waterfowl to retreat. Grass owls have been observed hunting along the grassy channel. In summer and spring insectivorous bats feed on emerging insects along the stream. Facilities along this section of Kedron Brook include a bike track which is part of a broader network and extends from the Zion Hill Bushcare site to beyond Pony Club Bend, Mitchelton. The northern bank of the Brook between the Gilbert Road Bridge and the Gympie Road Bridge is a dog-off leash area. This is a relatively expansive area that has become very popular with both local dog owners and those from beyond the local area. The floodway has changed in the past ten years from a barely used barren channel, to an area of open space well used by visitors for walking, cycling, relaxing or walking dogs. Well spaced trees, low shrubs and native grasses are now accepted as not significantly affecting the water flow during severe floods. 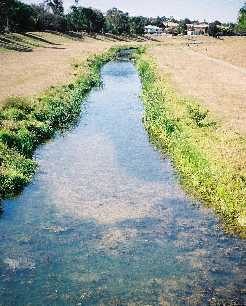 The current Lutwyche Reach Bushcare group was formed in 2001 through the amalgamation of several small groups that had been working in this section of Kedron Brook. plantings adjacent to Swinburne Street. 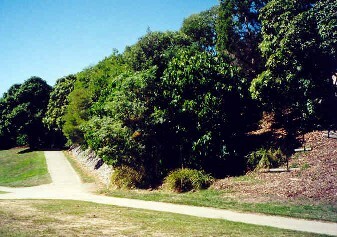 'Kedron Brook was moderately vegetated with tall trees. I remember some swings (into the water). The water level was a lot deeper; it was a great kids play zone. 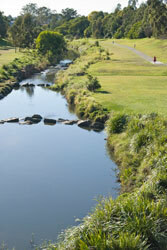 There were crossings along the creek and these were included in the Kedron High School cross-country course. Eels, turtles, platys, poddy mullet and swordtails were frequently seen. There weren’t as many ducks as now. Stands of bamboo and tall cane grasses were common, though there were fewer types of weeds than there are now. The number of weeds has increased since the council contracted out the maintenance of the area, resulting in less frequent grass cutting with machines of questionable hygiene. no filters of contaminants and sediments that may enter the Brook. 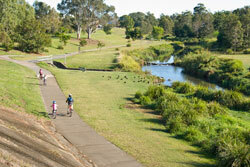 Kedron Brook is now widely used as a public thoroughfare for travel and recreation. 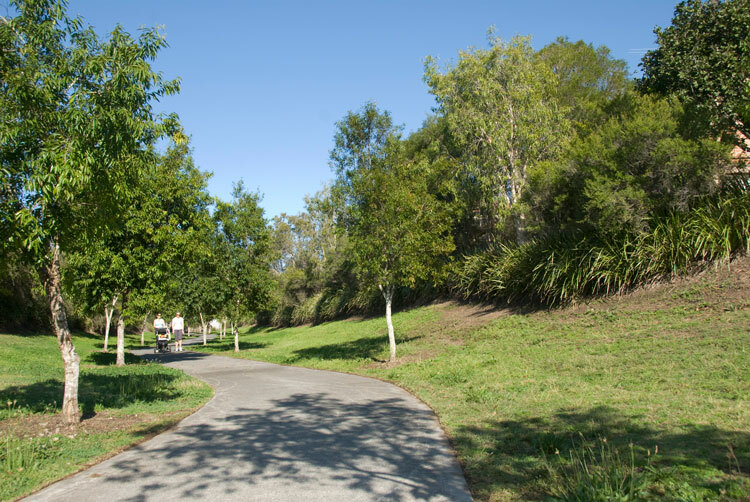 The plantings have improved the aesthetics of Kedron Brook. 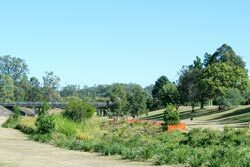 Wildlife pockets have been created, water dragons, lizards, birds and aquatic life turtles and yabbies all occur along the Lutwyche Reach. 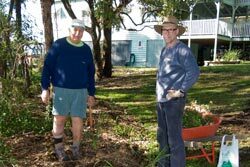 The Lutwyche Reach Bushcare Group has a number of sites at which activities are taking place. Many of the sites established by previous Bushcare activities need regular weed control and maintenance. This usually involves supplementary planting with understorey or shrubs to fill gaps and re-mulching of the planting site to control weeds. Some of the previous plantings are mature trees with a canopy over 5m tall. They shade the ground sufficiently that weeds do not thrive in this environment. Other than Damon Road, most of our work in the last few years has been maintenance, in the main, caused by the extended dry period. Now that we have some soil moisture at last we’ll have to start developing future sites in consultation with Habitat Brisbane. We are restricted from planting much down on the flat by flood mitigation. Quite a bit of what has been planted along the waterway banks, particularly trees, has been ripped out by the force of the water. Recent planting has included an extension of the Damon Road site eastwards to rehabilitate a steep bank that was covered with introduced dense grasses and shrubs such as Japanese Sunflower. The Damon Road Project has been undertaken in stages. The first two stages were established prior to 2001. Stage 3 was a 50m long section of the bank. 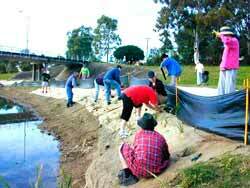 The steep bank rises about 12 meters above the flood plains and need stabilisation to prevent erosion. This shows the outcome of the successful planting near Damon Road. 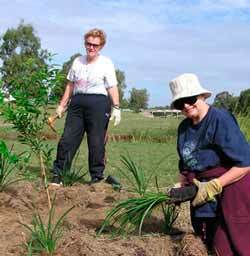 Planting of local native trees shrubs, grasses and Lomandra sp. was undertaken with the assistance and support of Men of the Trees. The initial planting was in October 2001 with a follow-up planting in April 2002. The fourth stage of the Damon Street project involved planting another section of the bank. 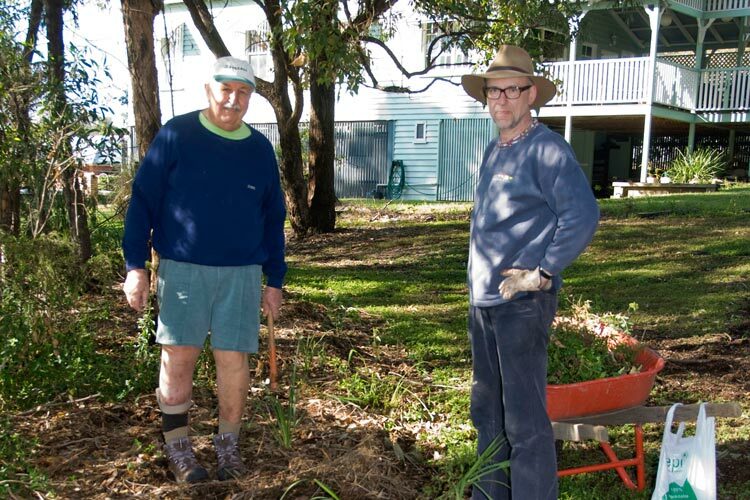 Brisbane City Council cleared tall grasses and shrubby weeds. The initial planting for this site was also undertaken with the assistance of Men of the Trees in April 2002. Several hundred trees, shrubs, grasses and herbs have been planted at the Damon Street Site. Plant survival has been good and the exposed site is slowly developing a vegetation cover. We are currently working on the fifth and final stage of the Damon Road project, up to and below the last of recently completed dwellings. The weather, both drought and flooding, has slowed progress. 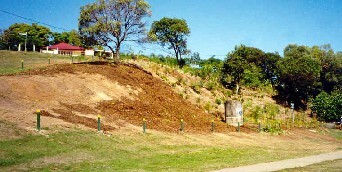 An initial clearing and planting was undertaken in May 2009. 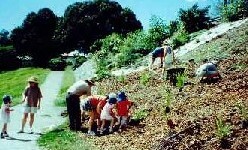 Supplementary and understorey plantings will be added to the planting during 2011. The group meets on the third Saturday of each month. Planting times are usually from 8.00 to 10.00 am. Tools, gloves and plants are supplied. Bring along a hat, sunscreen and water bottle. Our activities are carried out along the Brook between the two locations roughly specified by the following map references, UBD Ref. Map 139 N10 - Map 140 B7. Photographs taken before 2005 were supplied by Donald Hopkins.